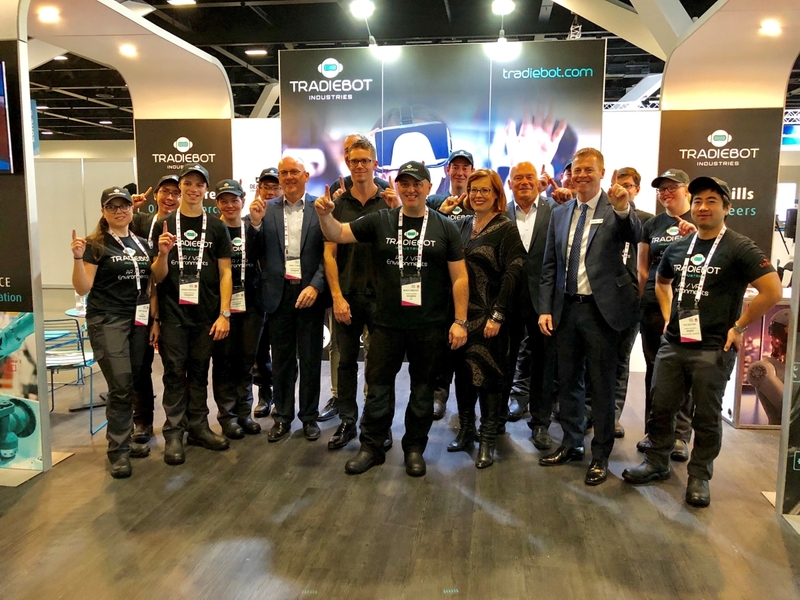 S.M.A.R.T were excited to be part of World Skills Australia 2018 in Sydney last weekend for the launch of Tradiebot Industries. Tradiebot Industries have launched a collaborative research project exploring the use of virtual and augmented reality technologies to develop a revolutionary new Industry 4.0 training system for the automotive collision repair and service industry. Future apprentices and their parents who attended the Skills Show were the first to experience Tradiebot Industries’ revolutionary automated and virtual environments in development including VR training for spray painting and AR training for auto repair. Tradiebot Industries and Deakin University were joined at the Skills Show by automotive industry heavyweights Capital S.M.A.R.T. Repairs and PPG, on a shared platform of taking a world-leading approach to training their current and future workforces, and a passion for unlocking and accelerating promising talent in science, engineering and future technologies. “Tradiebot Industries is working with us to look at how virtual and augmented reality technologies can revolutionise the workplace and automation. Immersive Reality, which encompasses VR and AR, provides a fantastic opportunity to help overcome some of the skills training challenges in sectors such as collision repair. Virtual Reality can provide access to training environments which are either difficult to access or don’t exist, and Augmented Reality can help provide digital assistance while performing a task. “At Tradiebot Industries we are creating the technologies that will revolutionise the automotive collision repair sector. Like many trades, our industry is facing a serious shortfall of skilled talent and an ever-widening skills gap as repair businesses struggle to keep up with the latest OEM repair methods and industry best practice. Rather than wait for our technologies to hit the shop floor and face a productivity-sucking gap while talent is trained up to use them, we are partnering with the leading employers who will be deploying these technologies, and developing state of the art training solutions now to teach the skills that will be needed. As a technology company, we think it is important that we play a role in the creation of new career pathways as we create technologies that help our industry evolve, informed by real-time data insights. We are creating new skills and exciting new career pathways in safer environments for both the talent we already have and to entice new apprentices to the sector. “S.M.A.R.T continuously strives to lead the repair industry by creating innovative solutions for our business partners and customers. “PPG has long-standing a reputation as an innovator so it is, perhaps, no surprise that we are always keen to welcome exciting new innovations and support their transition to market. The collision repair industry is constantly changing and, with each evolution, new technologies arrive and are embraced before going on to become part the ‘new normal’ repair process. What might a collision repair shop look like in 10 or even 20 years’ time? PPG has global research and development resources focused on these very questions. With that same vision in mind, PPG is very pleased to partner with Tradiebot Industries in the development of breakthrough technologies that will help to transform repair processes. Their approach and energy has mobilised resources from major universities and research institutions to tackle a range of ground-breaking projects. It is a promising look into the future of technology and training in the collision repair industry!